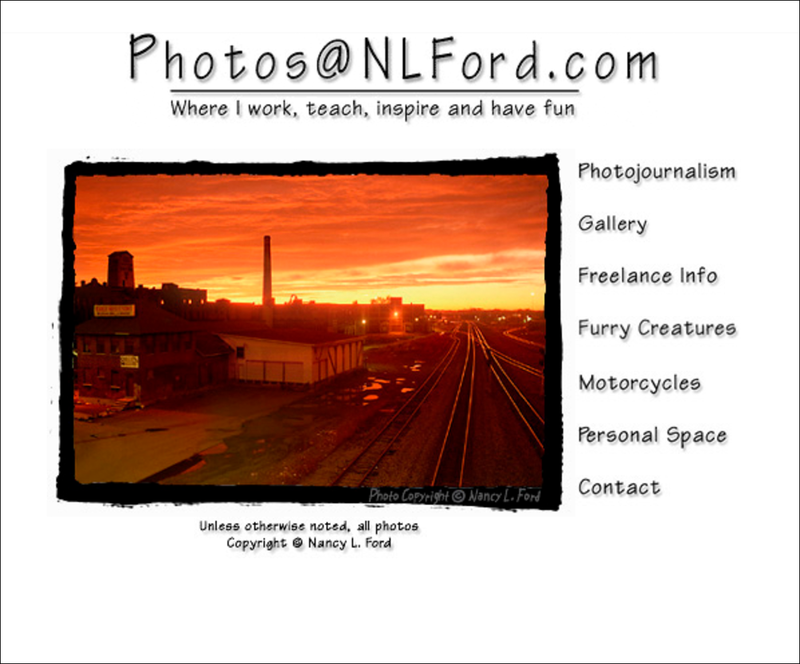 The 2nd or 3rd generation of NLFord.com, circa 1998-2002. A classic! The year was 1997 and a new frontier was well underway. It was a wild west of sort, unchartered territory with limitless possibilities. Back then having a website was not a necessity as it is today, but it was a full-time hobby of mine. Websites had become a form of self-expression for anyone with a computer, a US Robotics 56k modem, a domain, and a little HTML know-how. Things moved much slower then. The popular browser of the time was Netscape, which took an hour to download and install. 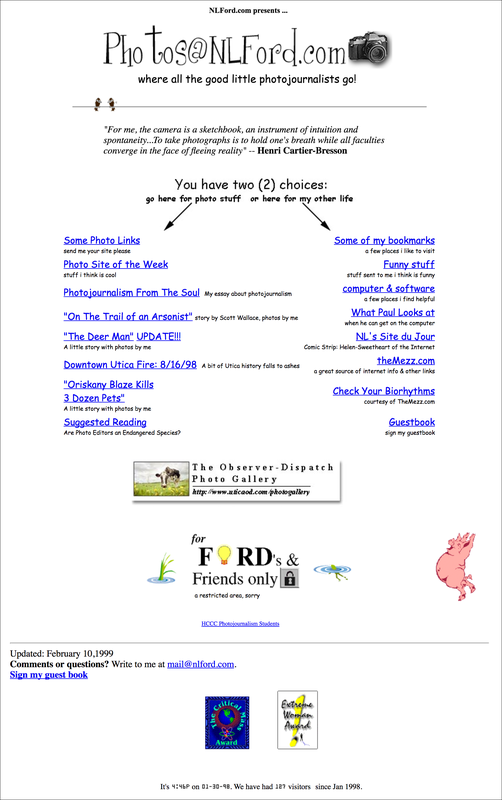 I built my first website using Netscape Composer and the vast knowledge of my dear, HTML-savvy friend, Joe Mezzanini. My first few websites had all the fixins. Written in Comic Sans, (the coolest font of the day), it had plenty of animated gifs, counters, guestbook, awards, photos of family, pets & friends, my favorite recipes, a page of links to websites that I liked, including the most popular, dancing baby avi and of course, a pig. 🙂 There were no “frames” or fancy drop down menus, just a list of links that led to pages, some of which were just list of links. Photos of my work were uploaded no more than 350 pixels wide because that was all the slow dial-ups could handle at the time. God bless broadband, fiber optics and whoever invented them. By my count, my website has gone over 4-5 major designs overs the past 25 years. Each one looking a little more grown-up, to today’s newly released, slightly sophisticated, all business design. This redesign was well overdue. The last one was in 2002, and as the world wide web became more and more insecure, I stopped updating it. It sat in the corner of my personal history gathering dust, off in some dark corner on my rented server. 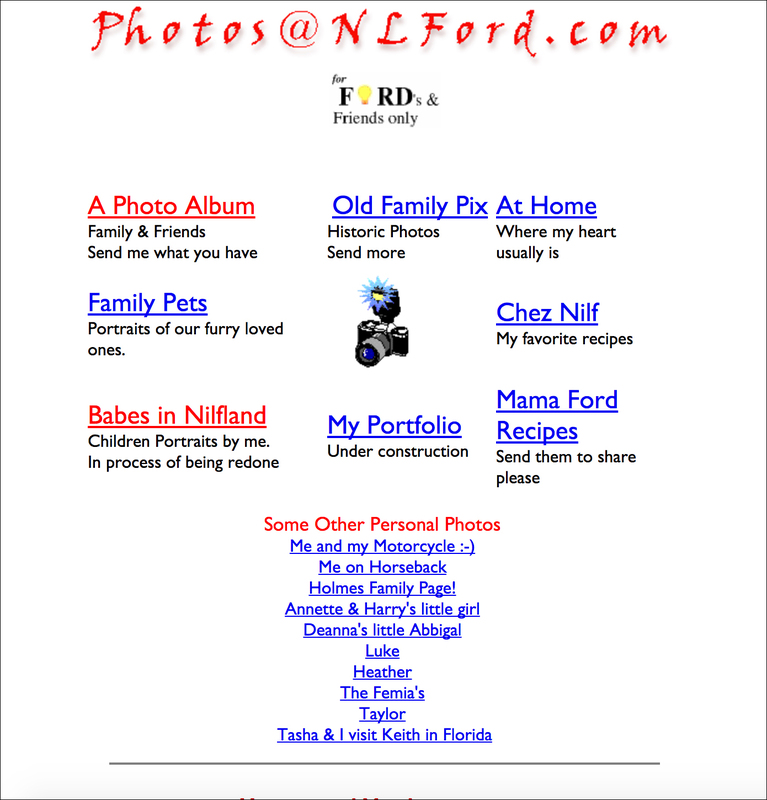 A personal, “family/friends only” page from the original NLFord.com from 1997. This time around it was much harder and took much longer. I had to learn WordPress, and refamiliarize myself with HTML again. But the hardest part was attempting to search through 35 years of a career, somewhere upwards of 75,000 photos that I had edited, toned, captioned and archived over the years. When I started this process, it was suggested to me to just pick out 20 or so photos in a few categories to show samples of my work. After spending a few weeks going through photos, I abandoned that suggestion. I didn’t want to just show what I can do, I wanted to show what I’ve done. I didn’t want samples, I wanted a portfolio of my photo life. I probably only got into half of my photo archive. I’m sure over time I will run into more I like, and yes, add them. So while I will apologize for the zillion of photos in the galleries, I am not sorry. One of my other missions of this redesign was to make the content more functional business-wise. I have more categories in the portfolio than I would like, but I felt I needed them so potential clients can go directly to the area of photography they are interested in to see my style and skill level. I made the categories more specific so they don’t have to weed through photos they don’t need to see to get to what they want. But all-in-all, the biggest surprise came while weeding through photos and filling in the galleries. It was profoundly educational for me to step back and look at what I’ve done, how I’ve changed and haven’t changed, and most of all, the discovery of some bad habits. I was able to get a grasp of what I do too much and what I don’t do enough of. I could see where I’ve grown stagnant and amazed at things I’ve learned, without even making a conscious effort. The last redesign before this new one was in 2002. I think that this design, with all the categories, will allow me to keep a check on what I’m doing…or not doing. It will keep me motivated and push me to try new things. Most of all, I really hope that the website continues to be a learning tool for students and inspiring photographers.